You know those foods that are so quintessentially Jewish that everybody associates them with New York and the Jews? 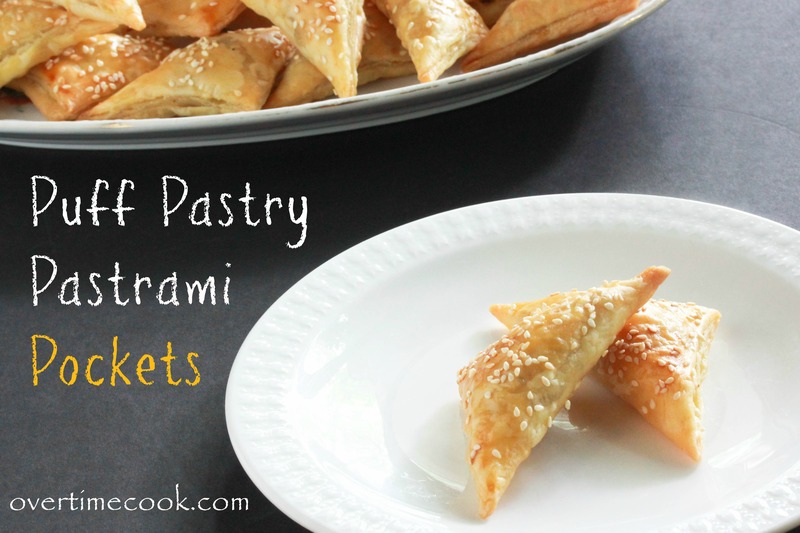 I’m talking about foods like K’nishes (remember how I posted a recipe to make those at home?) and a big ‘ol pastrami sandwich on rye bread. With a pickle. And sushi. Okay, that last one isn’t necessarily a Jewish food, but we definitely support Japanese cuisine as much as we do Chinese cuisine, in recent years. Well, here’s a food that is Jewish through and through: deli roll. Honestly, I’m often surprised that this hasn’t made it out of the Jewish world much, because deli roll is just plain delicious. But it’s also kinda boring. At least if you’re a Jewish gal from New York who’s grown up on deli roll every week for Shabbat lunch. So at some point I felt a need to update things a bit, and came up with this. It’s not healthy…at all. 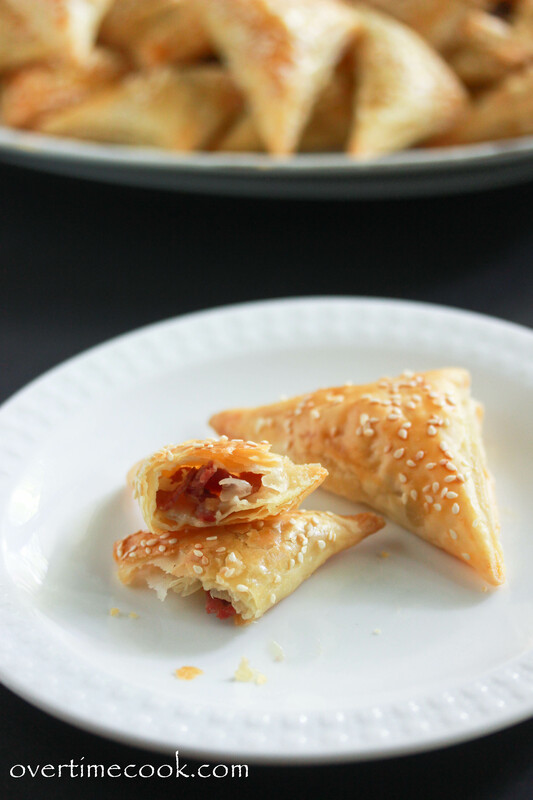 But it’s super easy, can be made and even frozen in advance, and it’s super delicious. 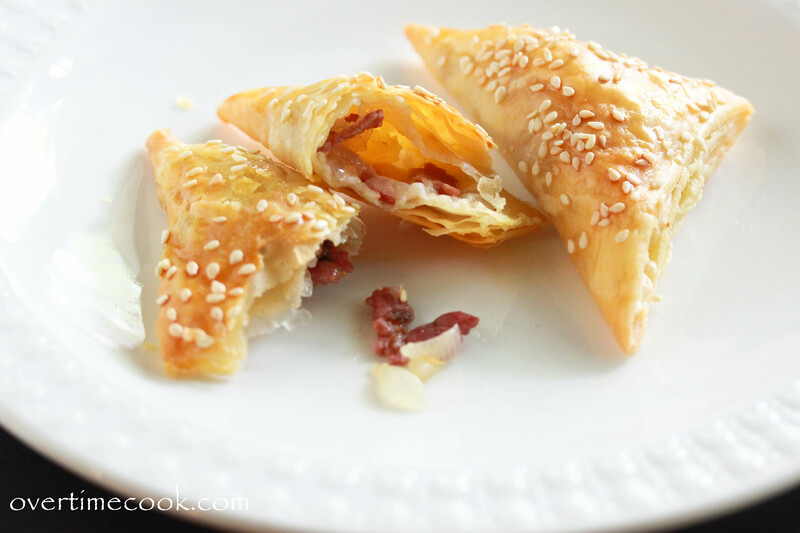 It’s a perfect little appetizer, especially for the coming holidays. Heat oil in a large frying pan over a low flame. Add the diced onion and sauté for a few minutes, until translucent. Add the garlic, pastrami, salt and pepper and continue to sauté on a low flame for 20-30 minutes, until reduced and smells great. Remove the mixture from the heat and set aside to cool for a few minutes. Spoon a small spoonful of the mixture into the center of a small puff pastry square. Fold it over and pinch the edges to seal. Repeat with remaining squares and filling. Place on prepared cookie sheet. If desired, brush the tops with beaten egg and sesame seeds. Bake at 350 for 30-35 minutes, until lightly browned. Remove from oven and serve hot. Do you cut up the pastrami before sauteeing? Yes, I’ll adjust the instructions. Thank you! Are these better to freeze raw? You can freeze them cooked – but raw is great that way they are fresh baked! I want to serve these as an appetizer, any recommendations for a fun dipping sauce? Maybe something mustard based? Thanks! do you think I can modify this for a deli roll? I only have the puff pastry sheets right now. Wow! Can’t believe it’s been so long since the recipe was posted and nobody spotted that before. Fixed! I quadrupled this recipe for an extended family meal (50 people) and made them with larger puff pastry squares. I threw together a sauce of sauteed onions, apricot jam, mustard, and honey and drizzled on top. Rave reviews!! Thanks for the recipe. LOVE your site!